Well, it began in the cellar of your house. — My house? The Old House? — Yes. I used to go there a lot before you moved in, to play. But somehow, this was different! 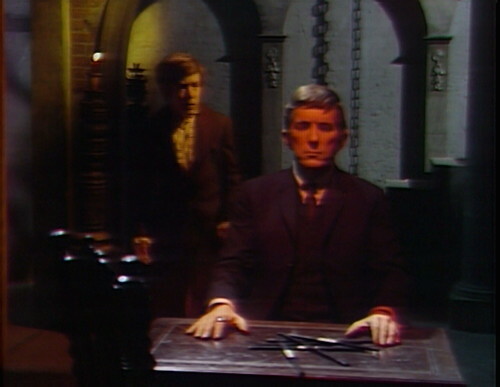 “It began in the cellar…” It’s true that the 1897 storyline began in that cellar, with Barnabas sitting at a table. But now the I Ching wands are in a heap, in no particular sequence. Barnabas is lost, irretrievable. The boy shakes him, and he doesn’t wake up. Perhaps he never will. Upstairs, we meet two lost souls — Carolyn and Roger — having a disagreement about throwing David a birthday party. “Birthdays are for people who get older,” Carolyn observes. She has a puppet, for some reason. 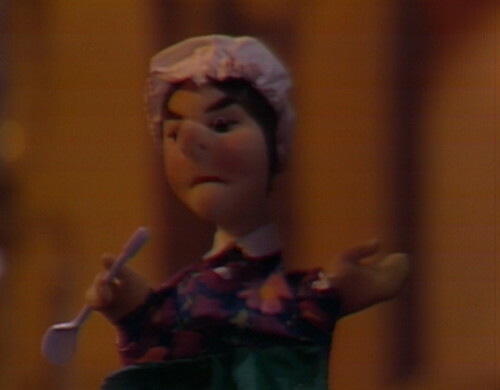 Carolyn consults with her puppet. “He’ll have to find out sometime, won’t he?” The puppet agrees. “Yes! Yes, yes, yes yes yes!” Carolyn breaks into a delighted giggle. Carolyn is extremely disconcerting during this entire sequence. The boy asks, “Do you think he’ll come to my next birthday?” And then everyone looks uncomfortable. Time is continuing in 1969. Last year, when Vicki time traveled to 1795, everybody else in the show obligingly stood stock-still, frozen within one tick of the clock. When Vicki left, it was November 1967, and when she came back it was April 1968, but nobody had actually done anything during that time, except the Beatles and Jim Morrison and NASA and Robert F. Kennedy and the Viet Cong. The Collins family stood in place, because all the interesting stuff was happening in the late 18th century. And we all assumed that the 1897 time trip would go the same way — Barnabas goes into his I Ching trance, and everybody else is waiting for that one tick of the clock. But that’s not happening here. Barnabas is gone, and Quentin was never there, and the present-day Collins family carries the burden of staggering through each day, one tick at a time. This is the show’s worst nightmare: 1969, without the kaiju characters. It is inexpressibly grim. And here’s where things start to go severely avant-garde. David: And Quentin! Where’s he? Liz: Look him up, Roger. Roger: Now, let me see… under Q… No. I don’t find a Quentin Collins listed here. David: But you know Quentin! Roger: But he can’t be here, he’s not listed. So take that, Pirandello, with your Six Characters in Search of an Author. Two can play at that game. Liz asks, “What about the cake, David?” and Carolyn goes off on some weird puppet jag. Now, I remember watching this for the first time on New Jersey Network, when I was fourteen years old. 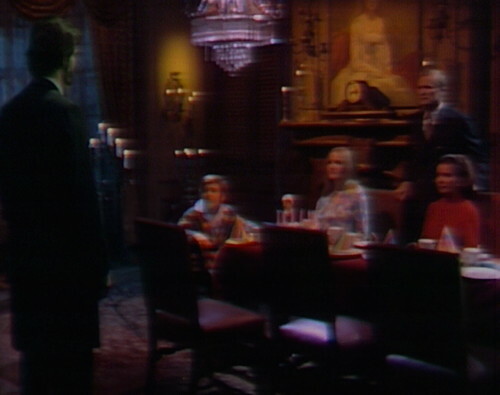 Obviously, I was never really scared by anything in Dark Shadows, because I was fourteen and it isn’t actually very scary, but this dream sequence creeped the ever-loving hell out of me. For one thing, David is just lost and pathetic. A little boy, dying, and everyone tells him lies — denying him even the comfort and fellowship that a devastating truth could bring in its wake. Roger is only thinking about the rules, and Liz is hardly there at all, and then there’s Carolyn, a ghoulish older sibling who’s openly mocking the dying kid, under a blood-red sky. I’m hungry, hungry, hungry! I’m starving… to death. That stayed with me, I can tell you that much. That line would pop into my mind when I least expected it, and I’d shudder, just thinking about this scene. Why is Carolyn being so horrible? Is this the way she really acts, when she doesn’t think the cameras are on? So what is this “Quentin” that appears at the make-believe birthday party? He isn’t Quentin as we know him — in fact, the “Quentin” that we first met now feels like an entirely separate character. The only thing he has in common with Quentin is the facial hair. It’s no wonder Roger doesn’t recognize him in the script. Maybe the ghost of “Quentin” that we saw a few months ago wasn’t really Quentin at all — he was an echo of an alternate future, a prophecy, telling us that 1969 is dying. If we don’t run away with Barnabas into the past, then these ticks of the 1969 clock will leave us hungry, hungry, hungry. In 1897, the ratings are amazing — better than ever, and still going up — but on the other side of the clock, 1969 is dying. The sun is going dark. We’re watching entropy inaction. “It’s hard to make plans in advance,” Elizabeth says. “So many things to do!” And if that isn’t the mission statement for Dark Shadows, then I don’t know what is. So this is what they’re doing, here on the obverse: a meditation on April Third, wondering what’s going to happen to them all. 1897 is and will always be their most popular storyline — but what do they find when they return to 1969? An uncared-for garden. Nobody is paying attention to these characters, and they’re drifting away. By the time Barnabas comes back, triumphant, there may be nothing left of the family he worked so hard to save. Even now — at the series’ highest point — the seeds of its destruction are sown. After all, you can’t have a highest point unless things start to go downhill, and they do. 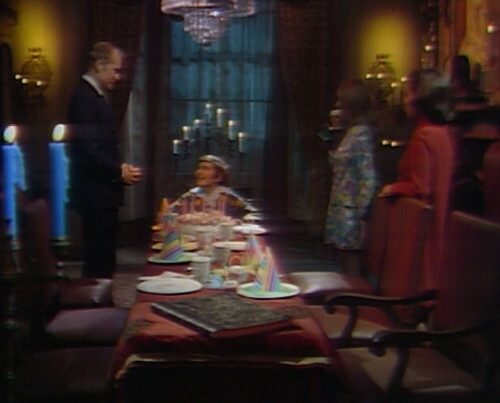 As Carolyn’s puppet might say: on April 3rd, 1971, Dark Shadows is going to a surprise party, and I know what the surprise is. And now, a word from the man from Porlock. Tomorrow: Number One with a Bullet. 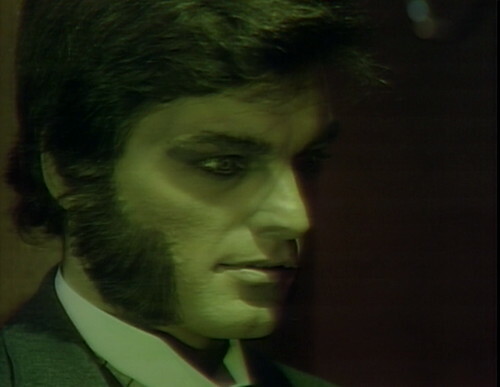 In the reprise of yesterday’s cliffhanger, Barnabas isn’t wearing his overcoat. When Carolyn says, “It’s ridiculous, having a party for him,” someone in the studio coughs. A moment later, when Jamison gets up from the couch, there’s the sound of glass breaking, possibly a bulb exploding. Dark Shadows isn’t really very scary? Try watching it in an altered state of mind, like a bout of the flu, or after that extra drink that you shouldn’t have had that makes you queasy and profoundly sick, or that extra puff off a joint that makes you float a bit too freely when you’re frankly a bit too uneasy about floating, or god forbid when you’re tripping. Just try any of these scenes where you have wandered a bit too far from that mental anchor that would otherwise help you to keep your thoughts and outlook above it all. 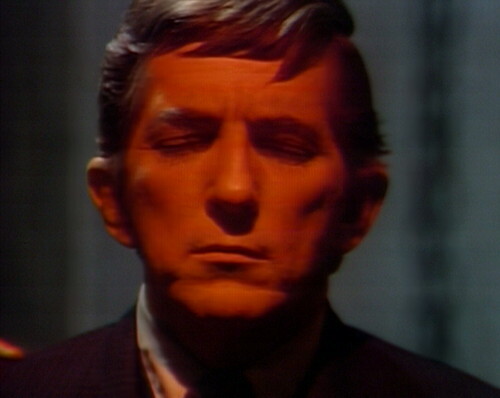 No, Dark Shadows isn’t scary–it’s friggin’ crazy! As for where the show is in terms of the compass of time. Well, perhaps 1969 was rather boring after all, particularly if like Dan Curtis you were born in 1927. Maybe 1897 was more fun, because you could be like a kid again and (re)invent your own world without having to actually be caught up in it for all its mundane boredom and idealistic disappointments. 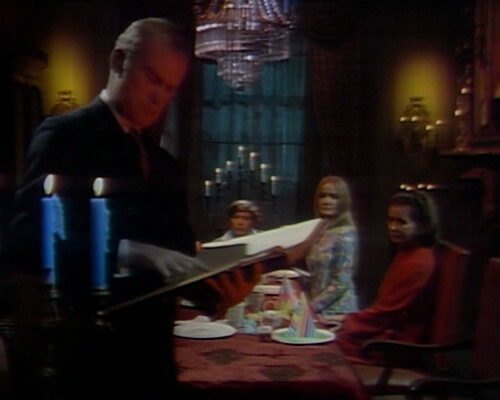 The more Dark Shadows goes along, the less time Dan Curtis wants to spend in the present day. In 1966 he’s there all the way, down to the last detail, chasing that filigreed fountain pen all over the place. But 1967, he can’t handle the whole year, he has to go back to 1795, and spends the first quarter of 1968 there as well. In 1968, his mind is all jumbled, and once he gets it clear he has to go to 1897 beginning by summoning ghosts who will eventually take him there, and spend most of 1969 there as well. He’ll give the new decade a try, but where does he pass the first part of 1970? In an antique shop. More of 1970? Not good enough–gotta make it somehow “parallel” or something. Back to present day 1970? Let’s just destroy Collinwood and get it over with, who cares? Let’s go to 1840 instead. Then, 1971? In between commercial breaks in one episode, he doesn’t even want to know about 1971 it’s so boring. Back to the 1840s until they just take the show off the air. Dark Shadows… was an experiment after all. When Curtis met with that network executive at the outset, the exec was willing to give Curtis 13 weeks, but Curtis wanted 26 weeks and got it. Under the threat of cancellation, Curtis decides he’ll just go out with a bang and have fun, bring Universal Monsters to daytime television, what the hell? Then it unexpectedly becomes a hit, and then the show becomes like a pop group and so you just go with it and see how long you can keep that top ten hit machine running. But like the Monkees, the Doors, the what have you, they’ll hit that zenith at some point, but it can’t last forever. The only option after that is self-parody and mediocrity. But Dark Shadows, not particularly scary? Well, maybe not. Maybe we can kick back and have a laugh about it, now that it’s all those years ago. But definitely still edgy! As pointed out above, next time you find yourself in a particularly altered and vulnerable state of mind, try having a viewing of this episode in particular, at the craziness of it all, as your mind melds with these scenes that have suddenly become all too crazy and ever present in your head. You wouldn’t be able to live in 1969, even if you tried. It would just be too crazy…. Great comments, Prisoner! And I agree- this is a super scary episode! Terrific performances all around, and the staging/lighting/filming contribute to the eeriness. I was 11 when I first saw this in DS’ first run. Creeped me out then and still creeps me out now – all without influence of fever or drugs! Man, i loved this episode, and Nancy Barrett – who’s no slouch as a performer in general, in fact she’s one of the most reliable actors on the show who always seems to give 100% – delivers a brilliantly creepy version of Carolyn. That entire scene around the table, with the puppet, really weirded me out. I mean, DS is throwing out curve balls all the time anyway, but this whole thing is so apropos of WTF. Often a puppet can express things that the puppet-holder cannot. This is a standard gag among ventriloquists: the dummy says off-color stuff and the ventriloquist goes, “Hey, it’s not me, it’s the dummy. Here something very creepy is going on with the gag. 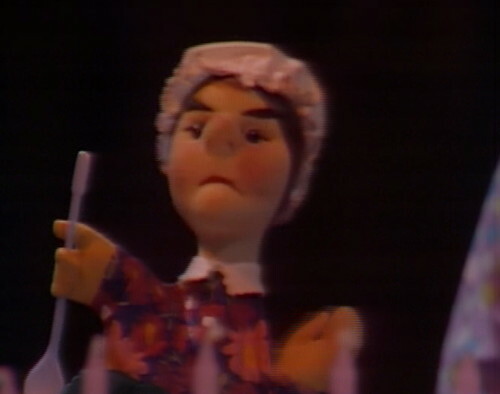 Carolyn, instead of the puppet, is saying the creepy things. This is my second-favorite Violet Welles’s dream sequence. I love how she embraces the theatrical conventions. I think DS has the ability to be “creepy,” which is more interesting to me than “scary.” I think even DOCTOR WHO of the time was “scarier” (behind the sofa) with its monsters. I love the Mad Tea Party comparison to this scene – I didn’t remember them showing anything from the current family when they were in 1897 – I know the DS Revival series showed the family in the present and 1700’s plots concurrently – which made the story more coherent because you got to see what was happening to poor Phyllis Wick at the same time you saw what was happening to Vicki – great post PrisoneroftheNight! This is one of my favorite moments in the show and I agree, one of the downright creepiest. 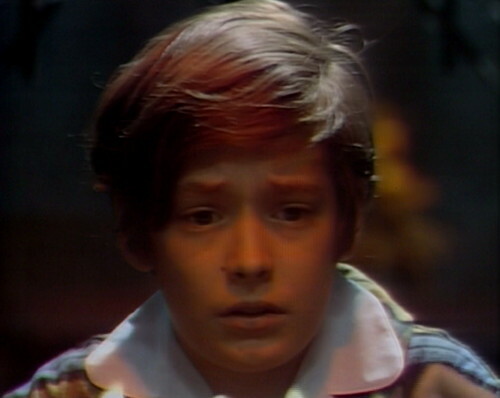 David Hennesy is amazing in this dream sequence! If only the Dream Curse had been this disturbing. I totally agree – this was a creepy dream sequence. 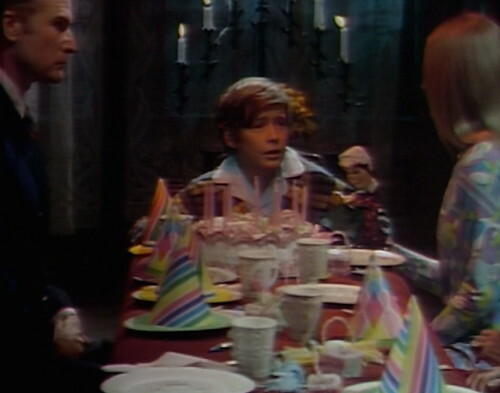 A few other creepies: (1) In 1967 when Barnabas terrorizes Julia while she’s alone at Collinwood. (Ron Sproat adapted this from an episode of the show DS replaced, called “Never Too Young.” He was a writer on that show, too.) (2) When Megan is alone in the antique shop in 1970. She is frightened that someone is coming to kill her, and Marie Wallace turns in a great performance. (3) In 1970, Liz has the dream that turns her into a Leviathan follower – it’s set in a fun house at a carnival, and was a totally different setting for a DS sequence. I seem to remember that they were playing with dates around Liz’s wedding, before they went to 1795. Soap time is extra-special. Even Einstein couldn’t figure it out. Does the disjointed dialog in this episode remind anyone else of odd 20th century theater? 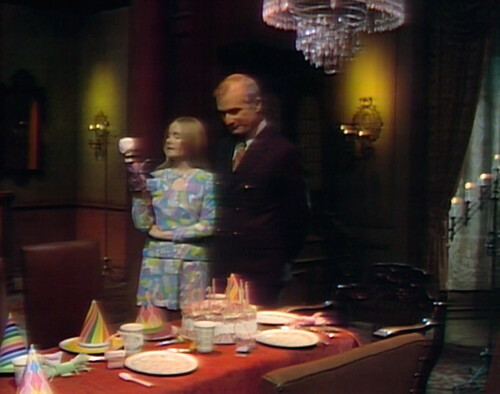 I wonder if Violet Wells had Harold Pinter’s “The Birthday Party” in mind when she wrote this episode, which is after all about a birthday party. The creepy puppet makes me think of Samuel Beckett too. In any case, a nicely disturbing bit of theater, especially for “disposable” day-time television. I must say this dream episode has become an instant favorite. It was bizarre, and I’m not entirely sure what it was all about, but I liked it. Carolyn and her puppet rule. The credits list each actor playing his or her 1897 role, but, actually, they all play dual roles in that Joan Bennett plays both Judith and Elizabeth, Louis Edmonds both Edward and Roger, etc. 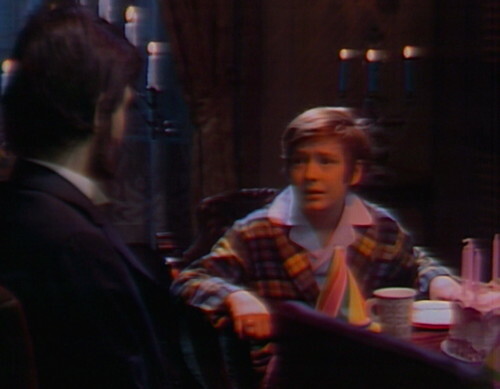 Even Barnabas – though he has no lines in the dream sequence – and Quentin appear as both 1897 and 1969 versions. (Quentin as his ghost self and Barnabas as his non-vampire self, in a trance in his basement.) So everyone in the cast plays a dual role. Cultural/copyright note: Dan Curtis probably had to pay the people who claimed to own the rights to “Happy Birthday” for its use in this episode. For about half a century, a company maintained that you had to pay them if you sang this birthday song either on TV, film, radio or even in a restaurant. (That’s why so many restaurants have their very own lame song for patrons celebrating their birthdays.) Then a couple of years ago a judge ruled that the company didn’t own the rights and hadn’t for decades, and they had to pay back everybody who ever paid them. 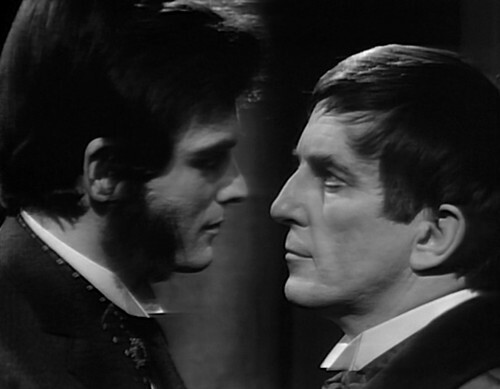 I just finished watching this episode for the first time, and it’s immediately jumped into Top 5 favorite episodes of Dark Shadows. I love the psychedelic side trip back to 1969, and I love how Quentin’s ghost is playing the sympathetic role in David’s dream. Good stuff all around.